This is another story about a crisis in a snowy hollow with a male and a female friend. This one takes place in the winter of 1984-85. I was a freshman at Carnegie Mellon and hung around a lot with my friend David (a different one) and his girlfriend Julie. One clear, cold winter night there was a social event for CMU freshmen: free ice skating at a skating rink somewhere in Schenley Park. David, Julie, and I joined scores of other freshmen in congregating outside Skibo (CMU’s meager student union building, replaced since then with a gigantic activity mecca) and walking about a mile and a half through the park to get to the skating rink. Now, Pittsburgh is a very hilly city. Its topography is characterized by wide, deep ravines that criss-cross the whole area. The ravines serve as natural boundaries to Pittsburgh’s neighborhoods. They are so prevalent, and form such effective barriers to getting around, that the city of Pittsburgh (which was compelled to bridge most of them in several strategic points) is second in the world only to St. Petersburg, Russia, in number of bridges! Or so I’ve heard. It was a very chilly and long walk to the skating rink. Once we arrived, I looked back and observed that the campus wasn’t very far away as the crow flies. 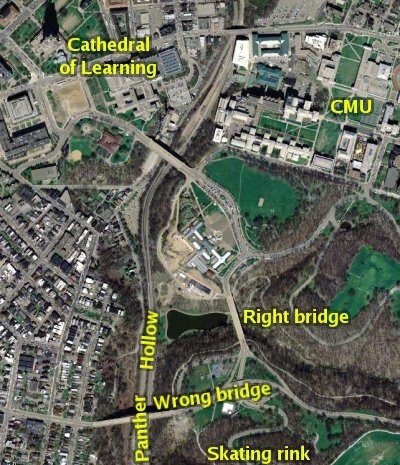 But because there was a ravine between the campus and the rink, we’d had to go far out of our way to cross a bridge and then backtrack once we were on the other side. I couldn’t really skate and neither could David or Julie, so at the rink it was a fun time of continuous near-falling and catching each other and crashing into things. When we emerged, I looked across the ravine at the nearby campus, then at the flock of freshmen trudging the long way around, and thought, “Not me!” Always valuing the bold departure from convention (sometimes to a fault), I announced my plan to cut straight across the ravine to get back to campus. David and Julie were in. We stepped over a small railing and immediately began descending the steep, lightly wooded hillside. Just a few yards from the well-traveled paths we left behind, we discovered that the snow was much deeper — up to our waists in some places. Soon we fell silent as we concentrated on safely making our way downhill. The snow and the steepness made it slippery, while hidden roots and bushes snagged our feet and made it more treacherous. In a few places we had to allow ourselves a controlled fall, catching hold of the next tree down. Finally we were on the level floor of the ravine (called Panther Hollow). From down there we couldn’t see anything atop either side of the ravine, but we could see the bridge. Lacking any other reference, we made for the bridge’s far side. As we crossed the center of the ravine floor, we sighted up and down the train tracks that bisected it and remarked on how remote it felt. It was dark, quiet, snowy, and a little eerie. We joked with Julie (who was Russian) about being in a Siberian wilderness rather than the middle of a medium-sized American metropolis. We reached the base of the hill beneath the bridge and began to climb. Almost immediately we realized what a pickle we were in. As difficult as the downhill part of our trek had been, the uphill part was all but impossible. It was just as steep and just as slippery, and though there were plenty of handholds in the undergrowth, the undergrowth was buried beneath several feet of snow, and of the three of us, only David had gloves! It looked like a long way up, and our hands were already aching with cold. David, a gentleman, gave his gloves to Julie (on whose small hands they did not “fit like gloves”). I also did my chivalric duty by climbing a few feet, getting a secure foothold, and then pulling Julie up, in alternation with David. Soon Julie was getting so much help this way that she relinquished the gloves; I got one and David got one. Our hands were numb. It had been fun up to this point, but now we saw how easily it could turn serious. An unlucky fall. Frostbite. Our mood turned grim. Halfway up the hill we reached one of the bridge’s stanchions: a vertical steel beam that disappeared into a cylinder of concrete embedded in the ground. David pulled himself up onto the concrete cylinder, whose top was level. There he pulled Julie up while I pushed; and then I followed. The three of us sat and caught our breath on that flat circular seat. The remaining part of the climb looked to be just as difficult, but it began to seem doable. We resumed climbing. Nearer the top of the hill, the snow was less deep than it had been. The hill was less steep. Soon we didn’t need our hands to climb. And then we were walking normally. And then, at last, we were at the top. The campus was nowhere in sight. We were in a run-down residential neighborhood with street names we didn’t recognize. The bridge beneath which we’d been climbing was not the same one that we’d crossed at the beginning of the evening. We had no idea where we were or how we could have gotten there. But it didn’t matter; we were no longer in peril. 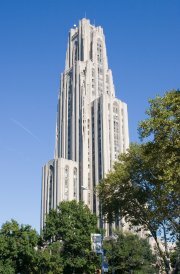 We struck out in a random direction and, before long, through a gap in the houses, we caught a glimpse of the Cathedral of Learning — as good a navigational beacon as any in Pittsburgh. Aiming for it, we finally emerged into familiar territory: downtown Oakland, a ten-minute walk from campus. We ducked into the McDonald’s to warm up and get some chow, then walked home, elated about the adventure and its happy outcome. My friend Julie died of cancer early in 2001 at age 36. Many months later it occurred to me to e-mail a version of this story to her mother, Olga. She’d always been very nice to me and I guessed she’d never heard it. I heard back from Olga promptly. She reported that, earlier the same day, she’d sent e-mail to Julie’s old account, which still existed, asking for a sign that Julie was still somewhere thinking about her family. In another example of the way things work out, my message arrived ten minutes later.